Fundamental differences in embryonic development mean that research using mice may not be reliably applied to other mammals, and that cattle embryos may be a better model for stem cell studies in humans. Feature: Droughts? Floods? Or Will We Run Out of Fuel First? Does the impending arrival of “peak carbon” mean that alarming climate change scenarios need to be revised downwards? Australia is losing a huge proportion of potential scientists as women drop out of science at a disturbingly high rate. Australasian Science profiles 12 women who have made outstanding contributions to science and technology in Australia. What are the secrets to their success, and what barriers did they have to overcome? Why is a university running a paediatric chiropractic clinic that targets the vulnerable parents of sick children? Fossil magnetic needles in ancient Australian rocks have revealed that the continent underwent a 40° twist that split apart its most famous mineral provinces. The possibility that political wrangling could lead to the closure of the Australian Synchrotron is almost beyond comprehension. Eco Logic: Does Recovery Planning Benefit Threatened Species? Our visual system is hard-wired to pay attention to people we’ve heard bad things about. Lowe Tech: Tassie Logging Agreement Toppled? Naked Skeptic: Are Invisible Rays Frying Your Brain? What are the dangers, if any, from radiation emitted by mobile phones, microwaves, power lines, WiFi and Bluetooth. 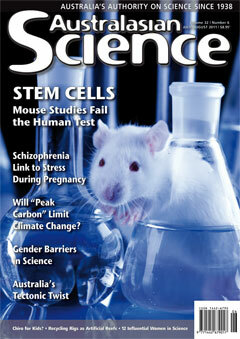 Induced pluripotent stem cells are not the ethical breakthrough they were initially thought to be. Australia’s new Chief Scientist could be as good as the first. The Tasmanian Tiger was named for its stripes, but a study of its elbow suggests that it also hunted like its namesake rather than living up to the nickname “the marsupial wolf”. Koala numbers are falling, and the problem is likely to get worse according to evidence presented to a Senate inquiry into the health of the koala population.